Vegetarian for Life administers two charitable funds, The Vegan Fund and The Vegetarian Fund. The Funds were launched in 2010, and we were pleased to award the first grant in May 2010 - for a stair lift to enable a vegetarian lady to move out of care, back to her own home, to resume independent living. Since then we have awarded a number of further grants, including assistance with relocation, a bath aid, vegetarian/vegan cookery courses for older people in Wales, a mobility scooter, a cooker and for fitting a downstairs shower room. In 2014, VfL commissioned a repeat survey of care homes, where we found that the percentage of vegetarians and vegans in care is quite small, at only 1.69% of residents, compared to 3% in the general population. This may well be because older vegetarians and vegans are more likely to be independently-minded and try to remain in their own homes for longer. They may also, of course, be healthier for longer. There comes a time, however, when some older people find it increasingly difficult to stay in their own homes, possibly due to health problems such as arthritis or general mobility problems. Financial assistance may be available, but can be difficult to access due to a great deal of demand. This is where the funds hope to help. Download the application form for vegetarians. Download the application form for vegans. You can fill in the form using your browser or the free Adobe Reader software. Alternately, you can print it out and return it to us in the mail. Call us on 0161 2570887 to request a form to be mailed to you. 59-year-old Peter D is a vegan from Norfolk. He has arthritis and successfully applied to the Vegan Fund for assistance with the purchase of a mobility scooter and shopping trolley/walker. This will mean so much to me. The scooter is absolutely fantastic and gets me around much better. The shopping trolley is especially for people with arthritis. With a metal plate in my wrist it will be a whole lot easier for me now and less painful. It will make my life more comfortable because my joints get quite stiff at times. Isobel S is a 70-year-old vegetarian woman living in Llanrhaeadr. Isobel initially contacted Care and Repair because she needed funds to repair the roof of her house. The roof was leaking and making her home damp and cold. Care and Repair and Vegetarian for Life have since worked together to achieve a successful result for Isobel. The contractors have now completed the repair to the front and back of my roof. They have done a lovely job – it is wonderful that this work has been done and I do not have to worry about the roof leaking any longer. The work has also made my home a lot warmer, which is an added bonus. I am really grateful for the help that I have received from Vegetarian for Life. John ‘Maz’ Marriott was diagnosed with M.E. in 2009. Maz has been vegan for 30 years, is author of low-budget vegan cookbook “The Chip Butty Vegan”, and huntsabbed since he first became vegan up until recently when he had to stop due to his health. Maz is dependent on a carer and a mobility scooter – and when his scooter broke he found himself mainly confined to the house. 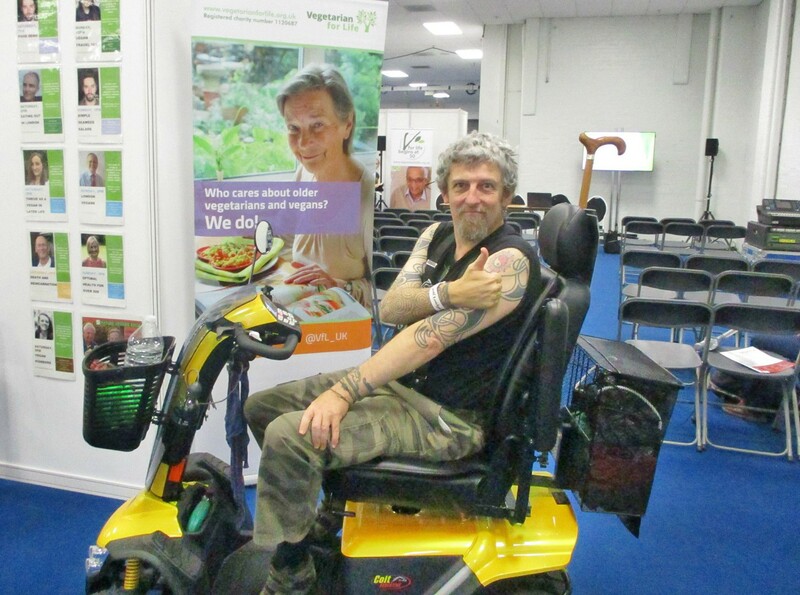 Since his new scooter awarded by the Vegan Fund arrived, Maz has been back at demonstrations in the city centre and in muddy fields, and we were lucky enough to meet him in person at VegFest UK. 84 year-old Stella has been vegan for over 30 years. The past few years have been extremely challenging for her because her hearing has deteriorated rapidly. This has left her feeling isolated from those around her, whom she struggles to understand. After years of being withdrawn from society and nodding and smiling in what I hoped were the right places, I can now converse with people without constantly asking them to repeat themselves. It is very liberating, with my confidence boosted no end. When she heard about the Vegan Fund she thought it could be her solution. Stella received her new hearing aid in December 2017, thanks to the Vegan Fund. Shirley K, a vegan in her late 70s is now able to get out and about thanks to a grant from the Vegan Fund. I am truly grateful to Vegetarian for Life for buying me my mobility scooter. The direction of my life was narrowing because my walking ability had deteriorated, but is now able to expand again. Shirley applied in Spring 2011 but it took some time to get the right scooter for her. Eventually the right model was tracked down from Kardinal and the grant covered the full cost of the mobility aid. Shirley, from Brighton, is a life member of Animal Aid and has been vegan for over 30 years. bathroom that VfL assisted with. These renovations would not have been possible without your kind offer. It will make a life changing improvement for my wife. And a grant from the Vegetarian Fund allowed for kitchen and flooring repairs for Mrs P, an older vegetarian. “My floors were so damp that it kept coming up through the floor and was getting worse. It was not possible to put any flooring down (carpets or wood) because it would have been spoiled by the damp. Obviously this was not helping my health at all and the room was just not useable. Also, my sink was falling to pieces! “With the money I have been able to get insulation, the rotten flooring removed, a new solid concrete floor, and the floors tanked so no more damp can get in. It has made such a difference and my room looks like a proper room again when it was just such a mess before. They also fixed my sink! 64 year-old Yvette became vegetarian after partaking in one of V for Life’s cookery courses. Yvette has recently been struggling to get out and about due to a number of health issues, and so applied for a laptop from the Vegetarian Fund so she can keep in touch with people and research from the comfort of her own home. The grant’s changed my life because I don’t have to go to the library or internet shops to use the computer anymore. I encountered lots of problems there, the computers were all booked, and you don’t have enough space to manoeuvre in the tiny cubby holes. When I wasn’t feeling well I still had to make sure I went, but now I don’t have to and can work from home and it’s comfortable. It’s definitely changed things for the better. I use the laptop for all the things I have to look up, and it’s really useful for typing letters, as I don’t enjoy writing by hand anymore. The grant scheme is definitely worthwhile. I didn’t think I’d get it, and was shocked when they said yes! I thought that because V for Life has to give to so many people, they wouldn’t be able to say yes to me. But they did. It’s a very good scheme. Grants are awarded on a one-off basis. They are not suitable for ongoing expenditure. Grants are normally made to assist ‘independent living’, for example: to provide ramps, grab handles, minor kitchen/bathroom adaptations, stair lifts, mobility scooter or perhaps respite care (a short stay in a care home for a person being cared for at home, to provide a break for the carer). Applications for other uses will be considered – as long as the grant will benefit one or more older vegetarians or vegans. Individual grants are normally subject to an upper limit of £3,000, but this may vary if the grant would benefit more than one eligible person or, at the Trustees’ discretion, if there are other extenuating circumstances. Each application will be judged on its individual merit by the Trustees of Vegetarian for Life, whose decision is final.